Run entirely along a 6.55-mile stretch of Highway 190 through the flat, desolate desert terrain of California’s Death Valley National Park, the Death Valley Marathon, Half Marathon & 10K offers one of the country’s most unique courses for running a road race of any kind. Out-and-back and surrounded by the sandy hills and mountains for which the park is known, the race is also relatively flat, featuring no more than 500 feet of elevation change over the entire route. From the starting line at the aptly named Furnace Creek Ranch on Highway 190, the race follows a simple, out-and-back route northward and southward along the road, and is run entirely on paved surfaces. Famous for its elevation below sea level (and, at 282 feet below sea level, as the lowest spot in the Western Hemisphere), the race features views of nearby mountain ranges including the Cottonwoods, the Blacks, the Grapevines and the Panamints. Though the race is run — thankfully — at a time of the year when Death Valley experiences relatively cooler temperatures, runners are encouraged to bring water with them along the course — even though aid stations will be provided — to prevent dehydration from occurring. Runners should expect the only real rolling hills of the race in the first three miles and last three miles of the race, as the out-and-back course takes them along the course they’ve just run back toward the finish at Furnace Creek. The race is a smaller one by most running event standards, as just over 175 runners crossed the finish line in the half marathon alone in 2016 (out of a total of 320 runners in all three races). Also, half marathon runners will need to keep a pace of at most 27:30 minutes per mile (13:45 for the full marathon), as there is a 6-hour time limit for all participants in the marathon, half marathon and the 10K. 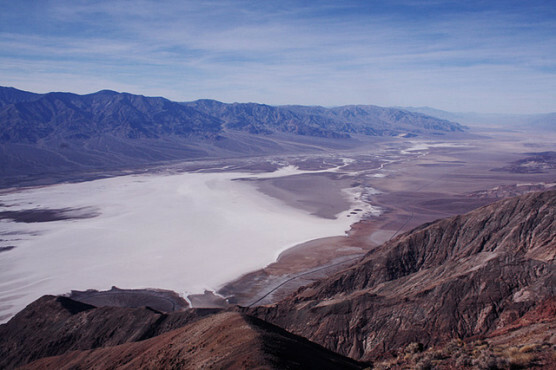 Located within the Mojave Desert of Southern California, just over 300 miles north from Los Angeles and roughly 130 miles west of Las Vegas, Death Valley typically sees January temperatures that average between 39°F and 66°F, while rainfall totals average less than half an inch for the month. On the day of the race (Feb. 2), the average low is 42°F and the average high is 69°F. See the Death Valley Half Marathon course map here. To sign up for the winter 2019 running of the Death Valley Marathon, Half Marathon or 10K race, register online at RaceRoster.com by clicking here. Ever run in the Death Valley Half Marathon? Share your impressions here, or post your review in the Comments box below. Where can I find my finisher time? Hello. I’m Bob Stumpf. I’ve registered for the Marathon. But because I had a slight knee injury, I had to cut my training short. Can I run the Half-Marathon instead? Many thanks.